After last week's new interface was published, our website was somewhat "lacking". Therefore, we're really pleased to announce the launch of our brand new website! Do check it out we'd love to hear what you think! The astute of you will notice our new command line toolkit taking a centre stage on the new site. This is now pretty much ready to go and we'll be announcing it before the end of the week. 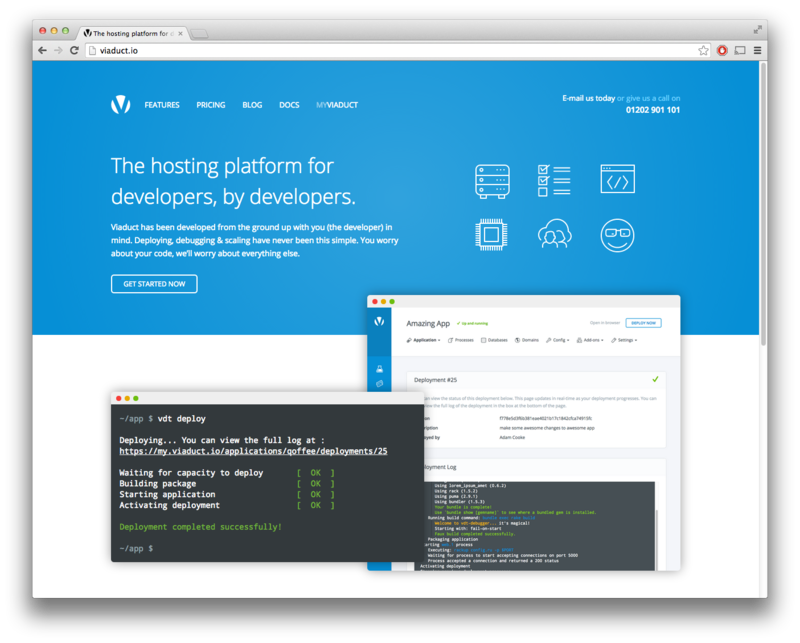 Viaduct is a hosting platform for deploying Ruby & PHP application to our high-speed and highly available cloud. Designed by developers, for developers. Every new post we publish is sent straight out to our Twitter feed. Follow us there so you don’t miss a thing. Our twitter handle is just @askviaduct.